Definitely Feeling like the Holidays! | ¡VidaMaz! Definitely Feeling like the Holidays! Thank you all for so generously helping out Desayuno de los Pollos. Today I went out with Roger, Sue and Dave on a toy shopping spree. We each pitched in several hundred dollars of our own money, but we used some of what so many of you have kindly donated for toys also. I’m guessing what we purchased today is going to bring smiles to the faces of 500-600 children, babies and teenagers this Christmas. We bought art supplies, games, toy cards, puzzle books, baseball bats, balls… While I felt bad to contribute to ruining our planet by buying cheap stuff from China, it was sooooo much fun to pick out the gifts, trying to balance girl, boy and gender-less items (difficult task, I might add)… I trust it lightens a parent’s worries a bit, as well. 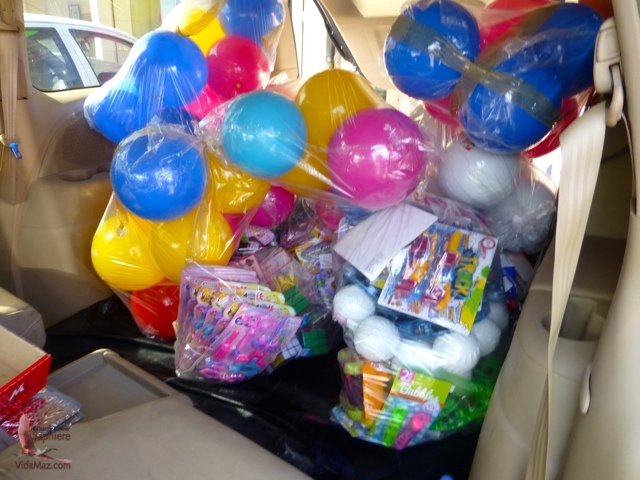 Many thanks to Importaciones Sanfri, who gave us a 20% discount on our purchase, because they knew the toys were going to needy kids. Today’s outing definitely put me in the spirit of the season! Thank you all! If you would like to contribute to buy toys, chickens, or anything else, please click on the “Donate” button on the upper right of this blog, or email me at dianne@vidamaz.com. We look forward to seeing you all on the 24th around 7 am! Glad it was a success! Congratulations & Merry Christmas to all!! We do the handing out of chickens and food stuffs, clothes and toys on the 24th, Alana. Today was just shopping. It was most definitely a success though! Merry Christmas to you and Richard! Thanks again, Dianne, for all your help and support! We´re on the last stretch!